Finding yourself in your 20s is a struggle almost anyone can relate to. As you strive to find that career that makes you happy and land that perfect job, as you try to find happiness, joy, and love from the people around you, the transition into adulthood is an overwhelming and confusing time. What director Joey Kuhn has captured in his film Those People is a beautiful and intimate portrayal of walking that journey into maturity and self-assurance that we all desperately seek. After his father is arrested on fraud-related charges and with his mother out of the picture, rich and charming Sebastian asks his long-time best friend Charlie to move in. Having been friends since childhood the two’s relationship runs deep. Charlie, pining for the affection of Sebastian, reluctantly agrees, understanding that at this moment his friend needs someone he can trust and rely on but is secretly hoping something more develops. On the night of Charlie’s birthday, he, Sebastian and their group of friends go to a piano bar to celebrate. There Charlie unexpectedly becomes smitten by a kind, handsome, and much older pianist named Tim. The two have an instant attraction. As Charlie begins to see Tim more frequently and their relationship grows, Sebastian’s resentment towards Charlie grows, for fear of losing the one person he has always been able to count on. Charlie’s life becomes complicated as his longstanding feelings towards Sebastian threaten to take down his blossoming relationship with Tim. What’s likeable about this film is the honesty and intimacy that the director was able to capture while telling this story. Kuhn, along with partner Grainne Belluomo have written a screenplay that has a naturalistic feel to it that many struggle to find but fail to achieve. From the excitement of a first date that has palpable chemistry to the quiet intimacy of a loving relationship, to trying to successfully navigate out of a quarter-life crisis, the characters convey emotion and complexity that make this film highly relatable. A cast of fresh faces radiates energy and chemistry into this film that feels contemporary and relevant to growing up in today’s world. Charlie, played by newcomer Jonathan Gordon, and Tim, played by veteran TV actor Haaz Sleiman have an immediate and authentic romantic connection on screen. Their relationship, as it develops, feels effortless and fulfilling. Jason Ralph’s Sebastian exudes a personality that slowly reveals its complexity and takes the character on a wide-ranging arc throughout the film. An aspect of this story worth noting is the tone in which the gay relationships are handled. This film manages to avoid the pitfalls that many LGBT films fall into by centering the story around the character’s coming out. 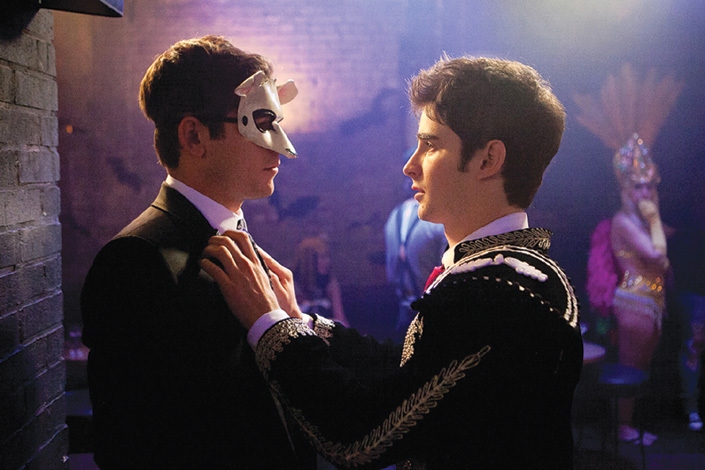 The central relationship in the film is treated with the same respect and accepting attitudes that a heterosexual relationship would be afforded. It’s unfortunate that it has to be said but it is refreshing to see a film treat the subject matter in this manner. Those People is a convincing portrait of a group of friends who are struggling to find their way in life, each one trying to cope with growing up and finding love, companionship, and acceptance. Representing a common pilgrimage that many people at this age face, these characters are looking for self understanding and for their place in this world. The film demonstrates this with sincerity and integrity that make it an accomplished and emotionally satisfying addition to LGBT cinema.